In contrast with the warm colours and textures commonly associated with Christmas, our latest style focuses more on dark, rich hues. Navy blues and warm wooden textures with just a hint of gold, reflect this mystical, fantasy trend, which is key to Autumn/Winter 18–19. 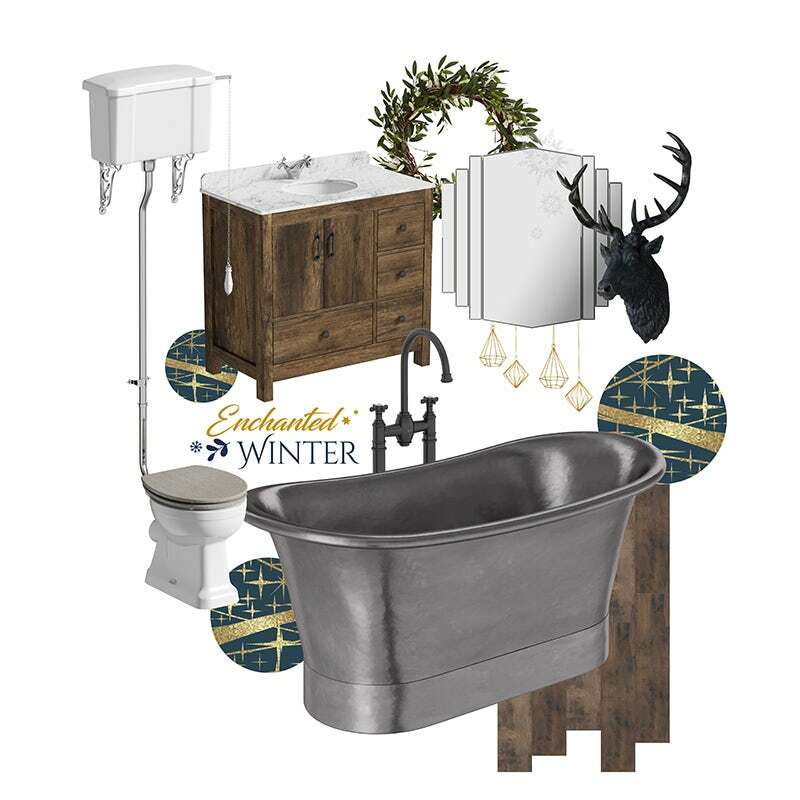 In part 1 of this 4-part style guide, you’ll discover just how to create your own “Enchanted Winter” bathroom, with the most magical time of the year just around the corner. What is the Enchanted Winter look? Christmas, as a religious festival, has been around for a very long time. Indeed, as early as the 4th Century, over 1,500 years ago, the 25th December had come to be accepted as the date that all celebrations would take place. Over the course of time, traditions and customs have changed, and these days, Christians and non-Christians alike observe Christmas as a religious and/or cultural celebration. Whilst our views on Christmas may differ from person to person, there is one thing that we can all probably agree: It’s a magical time to spend around family and friends. If the latest John Lewis TV ad proves anything, it’s that Christmas promotes a sense of nostalgia, which is what Enchanted Winter delivers in stockingfuls! Designed to fill us with a childlike sense of wonder (something we may have lost on the journey into adulthood), Enchanted Winter will help us to capture the spirit and essence of Christmas past. The look is refined and sophisticated, with a touch of rustic charm, presenting a more classical interpretation of the festive season. Next, I’ll take you through some of my top tips for creating your own Enchanted Winter bathroom. It’s not the first time we’ve seen darker, more theatrical settings used in bathrooms. If you look through some of our most popular bathroom styles, like Vintage Chic and Manhattan, you can see a trend emerging. 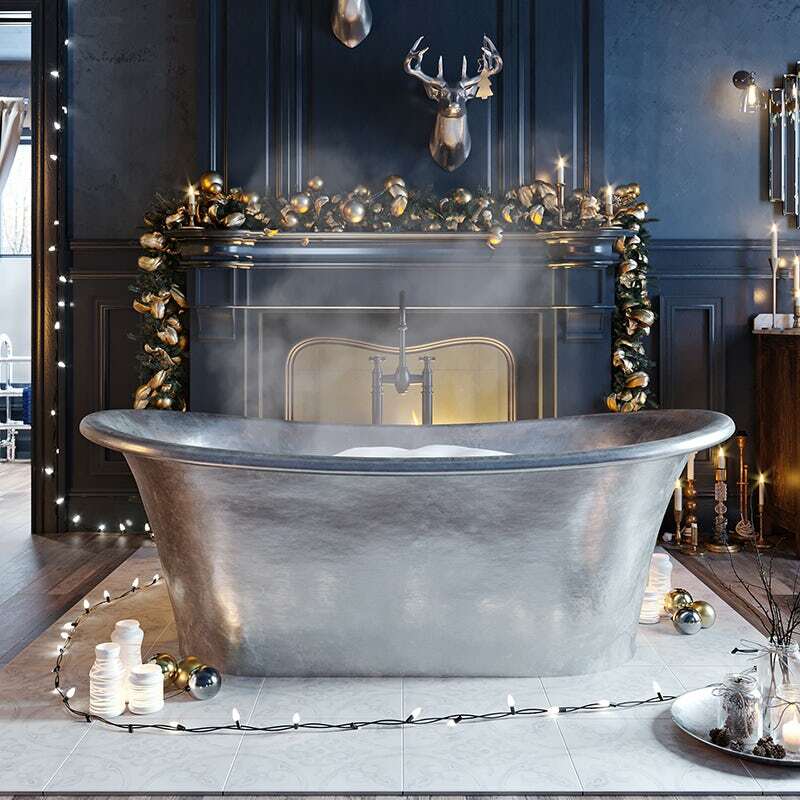 Experimenting with darker colours will increase in popularity in 2019, so even if you don’t want a Christmassy interior all year round, the moody and mysterious backdrop will certainly remain on-trend. We still find many homeowners searching for grey bathroom ideas, so don’t be afraid to explore darker monochrome palettes, with blacks, dark greys and midnight blues all popular choices. Try to work the same colour in using slightly different tones on different surfaces, to create subtle contrast and add structure to your interiors. Look at the different ways you apply colour to your surfaces, whether it’s using different paint techniques, or the use of different types of wall coverings, such as tiles, wall panels or even wallpaper. This will help to break up what could be one solid mass of dark colour. 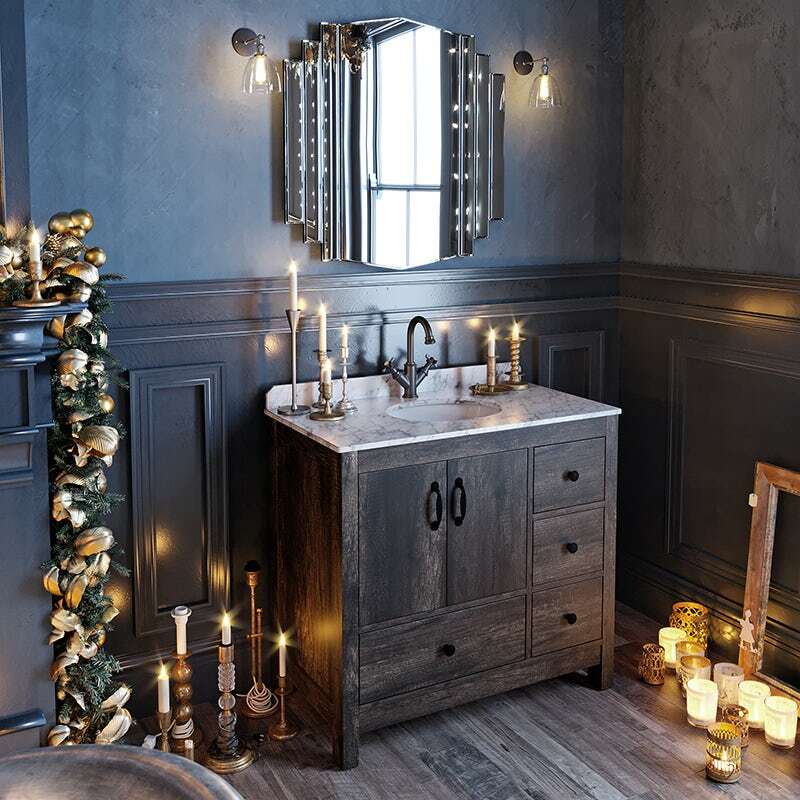 Christmas is full of customs and tradition (many of which will be unique to your own family), which is why your Enchanted Winter bathroom should be filled with traditional products. Seek out classical touches for your bathroom, with items like cross head handle taps, furniture with an antique or slightly industrial appearance and a high level cistern toilet with a wholly-satisfying chain pull flush. If you have the space, a roll top bath in a traditional design will make the perfect centrepiece. We chose a tin bath which, whilst having a more industrial appeal, also gives a real link to historic bathroom settings. To accessorise, vintage mirrors, ornaments and traditional radiators or heated towel rails will all add to the classic, refined look. When reading this blog post, I can almost hear many of you thinking “What happens when Christmas is over?”. Well, the great thing about this look is that the overtly festive elements only have to be temporary, unless you really do wish it could be Christmas every day! Gold works really well in this darker setting, adding a glittering counterpoint to your moody walls and floors. Some gold coloured candles and accessories will really help to add a warm and inviting feel to your bathroom, lighting up your space. Don’t be tempted by reds and greens as they won’t create the desired effect against your backdrop. Love the Enchanted Winter look? However you spend Christmas, there is no denying that the Enchanted Winter look is full of magic and mystique, which will endure the whole year round. However, if you don’t think your small bathroom could be transformed in this way, think again. In part 2 of this style guide, we’ll show you how to get the look in a small space with some inspiring small bathroom ideas. Click on the image below to head there now. In part 2 of this 4-part style guide, we'll show you that size doesn't matter when creating an Enchanted Winter family bathroom, ensuite or cloakroom.